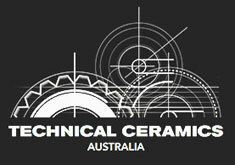 For years now we have been designing, and manufacturing world-class products from ceramic materials. We start from scratch with our enquiries and have been very successful remodeling items for sectors such as Mining, Automotive, Heating, Marine, Food Process, Infrastructure, and Manufacturing. We produce a world-class product at a very competitive price level. In fact our tooling is cheaper than any competitive quote guaranteed. If you need advice on replacing a current underperforming item with a ceramic replacement then we will help you from start to finish. The following gives information on some of our most popular K-TCA materials.